In this image I’ve listed the smallest components of every theory on planning the training process. In fact, before we discuss which planning and programming method is better suited for a certain situation, we should agree on the terminology; and even more important, the very concepts that form the theory of planning and programming the training. First, let’s define planning and programming. Planning may be defined as the long and mid-term strategy that regulates the training process, i.e. the structure within which the training process will take place. Programming, on the other hand, is the act of filling said structure with actual content, i.e. the actual training modalities. The Periodization of the Annual Plan, which by dividing the year into smaller training phases, makes it easier to manage the training and peaking processes. The Periodization of the Conditional Motor Capacities (aka bio-motor abilities), which enables one to develop the motor capacities: strength, speed and endurance to an optimal level for sport performance. 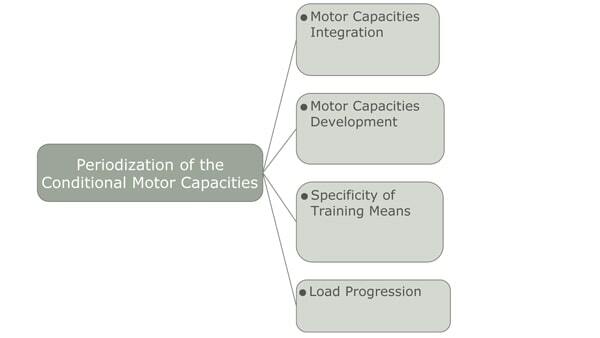 Given what has been just stated, each time we have a division of the year into smaller phases and a sequence of development for each conditional motor capacity, we have a periodized plan. Some critics of periodization state that it was born for individual sports that include a long preparation phase and a short competitive phase. Thus, it would not be applicable to modern team sports; which have a short preparation period and a very long competitive period. This would only be true if one combination of all the factors were possible. In reality, however, we may design as many periodized plans as necessary; relative to the possible situations we may encounter in the sport training process. Furthermore, if we were to analyze what these coaches actually do, their plans would still entail a division of the year into smaller periods and a periodization of conditional motor capacities; thereby, satisfying the requirements to define those schemes as “periodized plans”. Typically we may observe critics of periodization confusing programming with planning. Thus, criticizing the latter broader concept on the basis of some evidence that one particular method works better than another. This should bring to mind the discussion of linear vs non-linear periodization, which is based on the misconception that periodization is “classically” linear. Such debate is actually just a discussion of the macrocycle load progression. This doesn’t invalidate the concept o periodization itself. Again, many coaches confuse sequential with linear, when the latter applies to the load progression, and the former to either the integration or development of motor capacities. A similar situation has been sparked by the study by Mann et al. on The Effects of Autoregulatory Progressive Resistance Exercise vs Linear Periodization on Strength Improvements in College Athletes. This study practically compares autoregulatory RM training with a pre-fixed percentage/load linear progression. De facto, such kind of autoregulation is not a novelty. It is, in fact, a common practice using RM training in hypertrophy macrocycles; and to a lesser extent, in maximal strength macrocycles, where more advanced coaches tend to favor sets of explosive concentrics not taken to failure. Thus, autoregulation may be utilized as a load regulating method within a periodized plan. The mechanistic rigidity often associated with the concept of periodization is probably based on the linear periodization of strength popularized in the US in the 80’s, which required very long training periods during which time the body was supposed to go thru a “mathematical” progression. Such an approach has little to do with the more sophisticated, and educated, periodized strategies of the best coaches who base the load determination on a continuous feed-forward/feedback/adjustment process, as it should be. 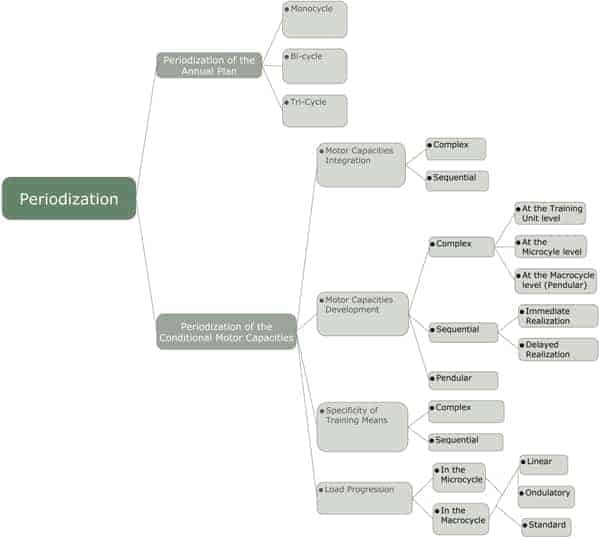 I will not spend much time on the periodization of the annual plan, as most of you are probably familiar with the concepts of phases, sub-phases, macrocycles and microcycles, as well as that the number of repetitions, in a cyclic fashion, of the preparatory, competitive and transitory phases, within a training year, determines if a plan is mono, bi or tri cyclic. Complex: strength, speed and endurance are all trained at the same time. Sequential: strength, speed and endurance are emphasized at different times during the annual plan (concentrated loading). In such kind of plans, usually it’s strength that is separated from the development of speed (for example, Verkhoshansky’s strength block). Training Unit; maximum strength, speed strength and muscular endurance are trained with this sequence within the single training unit. Microcycle; maximum strength, speed strength and muscular endurance are all trained in the microcycle, in different training units. Macrocycle; maximum strength, speed strength and muscular endurance are trained throughout the macrocycle, during dedicated microcycles. An immediate realization; at the end of the macrocycle, the indexes of the trained conditional motor capacity quality are improved. A delayed realization; at the end of the macrocycle, the indexes of the trained conditional motor capacity quality are depressed but improve later on (aka planned overreaching). Again, we can have two different approaches for the use of specific training means. Allow me to provide you with an example of what happens in the world of football (soccer) training. For instance, in some third world countries, where the number of teams is small, the competitive season is short. Thus the preparation period is longer than what we have in Europe. During their general preparation, the training is much more concentrated on the improvement of the conditional motor capacities than on the use of specific means (the ball) and loading parameters. On the other hand, in Europe, players use the ball (specific training mean) from day one of the relatively short preparation period (in which the training of conditional motor capacities still dominates) and might play the first friendly game after only 5-7 days of preparation (specific loading parameter). For the sake of terminology consistency, I have called such approaches sequential (when the use of general training means precede the use of specific training means) and complex (when general and specific training means are used simultaneously). 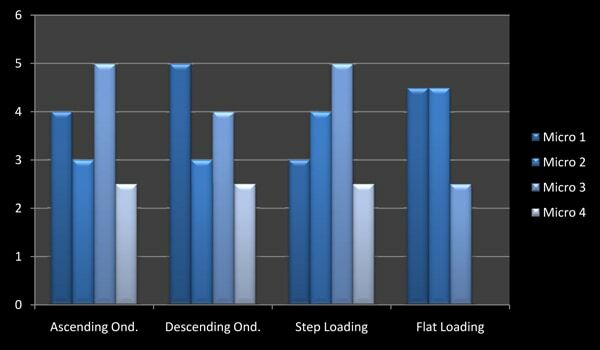 Linear loading has been proven, both scientifically and empirically, to be an inferior way of applying progressive overload. In fact, it’s very unlikely that a biological system progresses in a mechanical/mathematical fashion over time. A cyclic, undulating and self-adjusting model is certainly more adequate to elicit continuous and positive morpho-functional adaptations. Such characteristics can, or better yet, should be taken into consideration when designing a periodized plan. The undulation can take place at the macrocycle and microcycle level. The macrocycle can be undulated by alternating microcycles of different load (Column 1, macrocycle sometime used by Cuban weightlifters, and 2) or by placing a deload microcycle at the end of it. The previous loading microcycle can have the load progressed either in steps (Column 3, typical general preparation macrocycle set-up) or be flat (Column 4, typical specific preparation macrocycle set-up). The undulation of the load within the microcycle follows the very important methodological concepts of energy systems and load alternation. 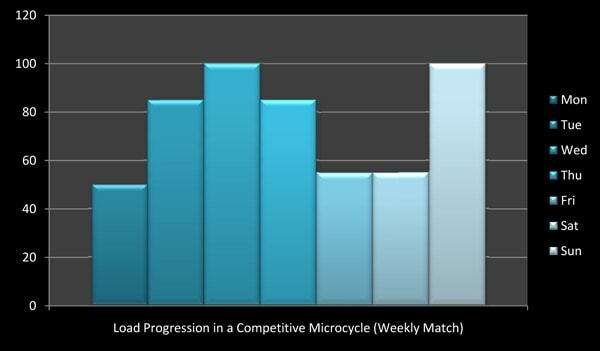 In the case of competitive microcycles, the need for post-competition recovery and pre-competition deloading should also be taken into consideration. The self-adjusting characteristic is obtained via the constant monitoring of the athletes, the readiness to change the daily program according to their feedback, the objective data collected during the training session, and by the placement of testing at the end of each macrocycle. Periodization is not set in stone; rather it’s a bundle of methodological concepts whose application we adapt to specific situations. For this reason, it can take many different forms. Coaches should be aware of the existence of different planning models that are more indicated for certain sports and for certain athlete’s developmental levels, On the “programming side”, knowing the methodological concepts related to programming, along with basic exercise physiology knowledge, should enable the coaches to have theoretical intuitions on how the bodies of their athletes work and change upon the application of the training stimuli. Thus, permitting coaches to foresee the morpho-functional adaptations they seek. Nevertheless, the constant monitoring, assessment and adjustment of the program is paramount to achieve the maximum possible results.